This show is rated G for all ages. 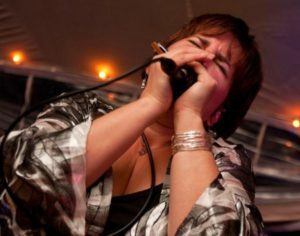 Diane Blue is a soul-stirring vocalist, skillful harmonica player, and a crowd-pleasing entertainer. Voted “Outstanding Female Singer” in The Blues Audience 2015 and 2011 Readers’ Polls, Ms. Blue is a soulful and sassy performer with a strong and energetic delivery, serving up her own spin on soul, blues and R&B. Ms. Blue and her band won the 2010 Massachusetts Blues Challenge, earning the honor of competing at the 2011 International Blues Challenge in Memphis, Tennessee. She was nominated “Best Blues/R&B Act” and “Best Female Vocalist” in 2007 by the Providence Phoenix and also nominated “Best Local Blues Act” by Motif Magazine in 2007. Diane has played harmonica and/or sung with guitarist extraordinaire Ronnie Earl, as well as international performers Luther Guitar Jr. Johnson (former sideman for Muddy Waters), Big Jack Johnson (of Clarksdale, Mississippi) and Irma Thomas (the Soul Queen of New Orleans), among others. Ms. Blue tours in the U.S. and abroad as a featured performer, in addition to her duties with the Broadcasters. Ms. Blue performs alongside Bruce Marshall (Tony Cladwell Band, James Montgomery Band, BMG), Chuck Farrell (Peacheaters, John Butcher’s Band), Tim Archibald (RTZ, Peter World’s House Party Five), John Vanderpool (Extreme, Heavy Metal Horns), and Pete Premo (James Montgomery Band, BMG).